Vlad Marine Inn i Vladivostok, Rusland: Reservér nu! Vlad Marine Inn Hostel is located in the center of Vladivostok, a 5-minute walk from the Amur Bay, and an 8-minute walk from the railway station of Vladivostok. Attractions such as the Seaside Museum named after VK Arsenyev and Academic Theatre. Maxim Gorky, can be reached within 10 minutes. Vladivostok International Airport is 47 km away. 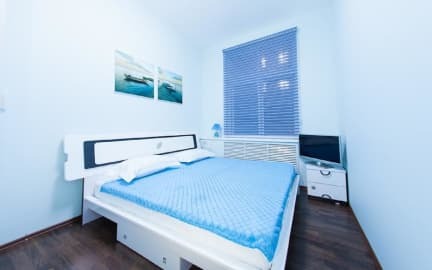 The bright rooms are decorated in blue tones and equipped with a flat-screen cable TV, as well as wardrobe and free toiletries. Vlad Marine Inn features a fully equipped shared kitchen and free Wi-Fi throughout the property.